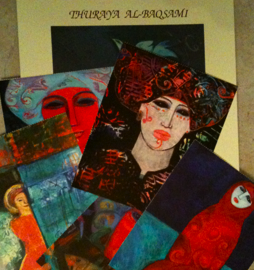 It was Thuraya AlBaqsami’s 55th exhibition. I have heard a lot about the artist, as she is well renowned in Kuwait. I finally got the chance to see her work and have few words with her. A very inspiring and humble being who transported me with few words into a world of her own. Magically traveling through space and time into her past and travels. “I painted this in Germany.” She explained, with passion synonymous to her name. I was escorted across her painting to a world I have never knew and ended up buying few postcards, as I did not know where to hang her artwork. I wanted to own more than one and the one that caught my attention the most was already sold. As I left she told me she was proud of her work and I replied that I think, “your life itself is an art work.” A personality to admire for many reasons too many to mention.